A heat pipe is a device that efficiently transports thermal energy from its one point to the other. It utilizes the latent heat of the vaporized working fluid instead of the sensible heat. As a result, the effective thermal conductivity may be several orders of magnitudes higher than that of the good solid conductors. A heat pipe consists of a sealed container, a wick structure, a small amount of working fluid that is just sufficient to saturate the wick and it is in equilibrium with its own vapor. The operating pressure inside the heat pipe is the vapor pressure of its working fluid. The length of the heat pipe can be divided into three parts viz. evaporator section, adiabatic section and condenser section. In a standard heat pipe, the inside of the container is lined with a wicking material. Space for the vapor travel is provided inside the container. The first consideration in the identification of the working fluid is the operating vapor temperature range. Within the approximate temperature band, several possible working fluids may exist and a variety of characteristics must be examined in order to determine the most acceptable of these fluids for the application considered. 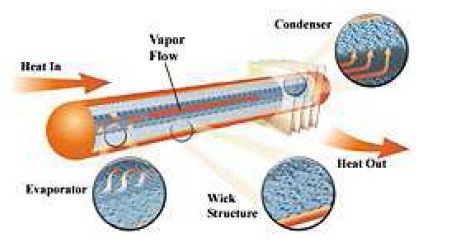 The wick structure in a heat pipe facilitates liquid return from the evaporator from the condenser. The main purposes of wick are to generate the capillary pressure, and to distribute the liquid around the evaporator section of heat pipe. The commonly used wick structure is a wrapped screen wick. A typical heat pipe consists of a sealed hollow tube, which is made from a thermoconductive metal such as copper or aluminium. The pipe contains a relatively small quantity of "working fluid" (such as water, ethanol or mercury) with the remainder of the pipe being filled with vapor phase of the working fluid. On the internal side of the tube's side-walls a wick structure exerts a capillary force on the liquid phase of the working fluid. This is typically a sintered metal powder (sintering is a method for making objects from powder, by heating the material until its particles adhere to each other) or a series of grooves etched in the tube's inner surface. The basic idea of the wick is to soak up the coolant. Heat pipes contain no moving parts and require no maintenance and are completely noiseless. In theory, it is possible that gasses may diffuse through the pipe's walls over time, thus reducing this effeciveness. The vast majority of heat pipes uses either ammonia or water as working fluid. Extreme applications may call for different materials, such as liquid helium (for low temperature applications) or mercury (for extreme high temperature applications). The advantage of heat pipes is their great efficiency in transferring heat. They are actually a better heat conductor than an mass of solid copper. As previously mentioned there is liquid vapor equilibrium inside the heat pipe. When thermal energy is supplied to the evaporator, this equilibrium breaks down as the working fluid evaporates. The generated vapor is at a higher pressure than the section through the vapor space provided. Vapor condenses giving away its latent heat of vaporization to the heat sink. The capillary pressure created in the menisci of the wick, pumps the condensed fluid back to the evaporator section. 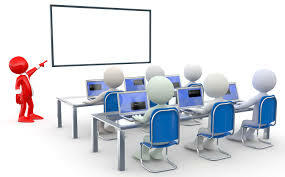 The cycle repeats and the thermal energy is continuously transported from the evaporator to condenser in the form of latent heat of vaporization. When the thermal energy is applied to the evaporator, the liquid recedes into the pores of the wick and thus the menisci at the liquid-vapor interface are highly curved. This phenomenon is shown in figure. At the condenser end, the menisci at the liquid-vapor interface are nearly flat during the condensation due to the difference in the curvature of menisci driving force that circulates the fluid against the liquid and vapor pressure losses and body forces such as gravity.